Presentation... 10 polymer beehive strips. Each 8g (+/-0.8g) strip containing 824mg tau-fluvalinate. DIRECTIONS FOR USE... Wear gloves when handling strips. Method of Application... The strips are bonded together in one sheet. To separate them, hold firmly at corner (see illustration 1), near top and pull along scored line from top to bottom. Replace the unused strips in the original package. Dosage instruction... Hives the size of National, Dadant, Langstroth etc., require two strips per brood chamber. For example, in the case of a Dadant 10 frame hive, one strip is suspended between frames 3 and 4, and the second strip between frames 7 and 8 within the brood chamber. 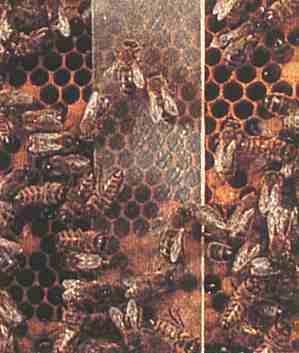 Small hives and nuclei require only 1 strip suspended near the centre of the brood chamber. Do not place strips in the honey supers. 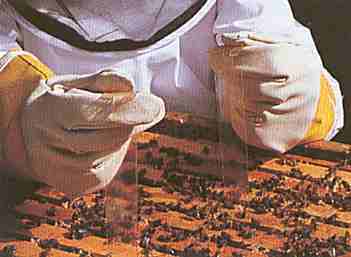 The Apistan strips are not in any way repugnant to the bees as can be seen in the picture at left. Duration of use... Treatment duration is 6-8 weeks after which time the strips are removed and disposed of. The strips should not be removed from the hive for at least 6 weeks. Do not leave the strips in the hive for more than 8 weeks. The treatment period should be kept as short as possible in order to reduce the likelihood of trace residues in the brood wax and to avoid the development of mite resistance. If signs of disease persist or appear consult your veterinary surgeon or veterinary practitioner. STORAGE & DISPOSAL... Keep out of reach of children. Legal Category... GSL, FOR ANIMAL TREATMENT ONLY. *... APISTAN is a registered trademark of Vita (Europe) Ltd UK.